This crime is otherwise known as "passing a bad check." The elements of the crime that the Commonwealth must prove in order to obtain a conviction on this crime, and the penalties following a conviction (or guilty plea,) are set out in Massachusetts General Laws Chapter 266 Section 37. The defendant had the intent to defraud either the person or organization to whom the check was made payable, or had the intent to defraud the financial institution or bank upon which the check was drawn. Essentially, the crime of larceny by check results when a person obtains property or services by writing a bad check, while knowing that there were insufficient funds on account to pay the check. 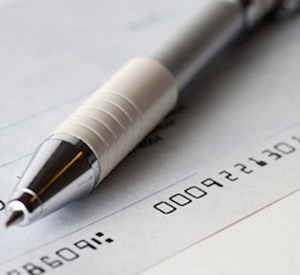 The law realizes that a person can innocently write a check without sufficient funds on account to pay the check, while never having the intent to commit fraud. Therefore, the statute allows a person a period of two days from the date of being notified by his or her banking institution that insufficient funds exist to honor the check, to deposit the funds necessary to pay the amount on the check. If the person who wrote the check does not deposit sufficient funds to cover the check within those two days, that failure is consider "prima facie evidence" that the person writing the check had the intent to defraud. That evidentiary presumption is very important. Assuming the prosecution can prove the above four evidentiary elements beyond a reasonable doubt, then the defendant will be convicted of larceny. If the money, property or services are valued at $250.00 or more, or if the property received as the result of the bad check is a firearm, the crime becomes a felony offense, and defendant can receive a sentence of up to 5 years in state prison or a maximum of 2 years sentence in a county jail, in addition to a fine of as much as $25,000.00. If the value of the property that is stolen as the result of the bad check is $250.00 or less, the crime is classified as a misdemeanor, and the statute provides sentencing of a maximum of one year in a county jail, or fines ranging to $300.00. However, if certain other factors exist surrounding the offense, a judge can increase the punishment. If the victim of the larceny by check is age 6o or older, or the victim is disabled, and the value of the property received as the result of passing a bad check is $250.00 or more, the defendant can receive a maximum sentence of 10 years in state prison, or up to 2 ½ years in a house of correction, and/or a maximum fine of $50,000.00. If the property received is valued at $250.00 or less, the defendant's sentence can be increase to 2 ½ years in a house of correction and the fine can be increased to $1,000.00. If, following the delivery of a bad check, nothing of value is received by the defendant in exchange for the check - no money, cash, services or property - then the defendant will be charged with the crime of "attempted larceny." If money, property, or services are in fact obtained, the individual will be charged with larceny. In addition to the above criminal penalties, a civil suit can also be brought for restitution of the amount of the bad check and consequential damages. Why Hire The Law Firm of William D. Kickham and Associates To Defend You? If you're charged with Larceny By Check, you're going to need a talented Massachusetts Larceny Defense Lawyer defending you. If you or someone you know has been charged with this crime or any other type of Massachusetts theft crime, you will need to contact a Massachusetts criminal defense attorney immediately. Call us 24 hours a day, seven days a week or contact our office for a free initial consultation. Whatever you do, do not hire an attorney based upon the lowest fee you receive. In the legal profession as in any profession, "you get what you pay for." If the attorney defending you is not very experienced in handling these types of cases, you will very likely end up with a less than desirable legal outcome. Don't make that mistake. Call us or contact us by email now.